Although it only dates back to the 1980s, so-called "bubble tea" (or "boba tea") comes in an astounding range of types and flavors. This popular milk and tea drink from Taiwan is a sensation worldwide and it's opened up an entirely unique category of beverages. From the variety of fruit flavors to slightly more adventurous bubble teas like avocado, you can take this drink wherever you like. Bubble tea is quite easy to make at home and you'll find bubble tea shops throughout your world travels. Bubble tea is simply a happy drink, so have fun with it. The basic bubble tea includes four elements: brewed tea (often black tea), milk (sometimes skipped), flavor and/or sweetener (e.g., fruit syrup), and tapioca pearls or a similar 'QQ' (chewy food appreciated more for its texture than its flavor). There may be a few extra ingredients and any of these four can be swapped out or eliminated completely. The world of bubble tea is vast and it comes in many types and flavors. The following lesson in bubble tea will focus on flavor alone. As you'll see, your bubble tea can take on almost any taste you can imagine and this list doesn't even begin to cover all of them (some tea shops offer over 200 flavors and styles). With any combination of bubble tea's four ingredients, there are endless possibilities. The main flavor for most bubble tea recipes comes from a syrup or powder. Just as coffee houses will have a line up of syrup bottles to flavor lattes, bubble tea shops will be stocked with a great variety of syrups and powders. Flavored simple syrups are the more popular flavoring option because they mix easily into the milk tea. Among the most popular flavors are fruits, particularly tropical fruits that are common to Taiwan where bubble tea was created. It is very important to know that bubble teas flavored with certain sour fruits should not include milk. The acids in these fruits tend to curdle the milk and that is one of the things that most bubble tea drinkers want to avoid. With all of these flavors, where should you begin? 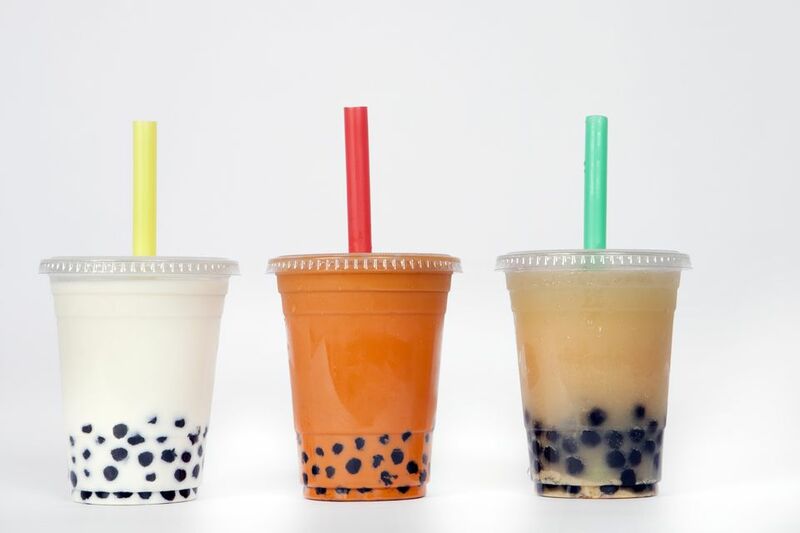 It's probably best to start off with the most popular fruit bubble tea flavors. They're a hit for a reason and a great starting point for your own bubble tea adventures. Stepping out of the common bubble tea flavors, you'll find that these fruits make an excellent bubble tea as well. If an avocado bubble tea sounds crazy to you, get ready for an adventure with these flavors. You'll find that the floral bubble teas are very pleasant. It's also hard to resist a taste of the sweeter flavors like chocolate and caramel. While the "bubble" in the name "bubble tea" originally referred to the air bubbles formed by shaking up the tea and milk mixtures, it is now used to refer to the "pearls" and other ingredients found in similar drinks. These drinks typically have what is called "QQ" in Taiwan and China. QQ is a chewy texture that is adored in Chinese and Taiwanese cuisines. QQ foods don't have to be flavorful to be popular, and they usually aren't. A prime example of this is tapioca pearls, the most popular and famous type of "bubble" in bubble tea. Tapioca pearls are small, round globules of boiled tapioca starch that provide a very chewy, almost gum-like texture and very little flavor. They are typically purplish-black, though they can also be white or pastel in color. A common variation on regular tapioca pearls is "boba"-- larger tapioca pearls, measuring about 1/4-inch in diameter. The size distinction of tapioca pearls is primarily made in Asia. The names bubble tea and boba are used more interchangeably in the West. Interestingly, the word "boba" is also slang for "large breasts" in Taiwan and parts of China. Similarly, tapioca "noodles" have become a popular addition to bubble tea. These are usually made from white tapioca and shaped into thin, noodle-like strands that can be slurped up through the wide bubble tea straws. Other sources of QQ in bubble tea include sweet potato, taro, "frog eggs" (actually a type of basil seed), sago starch pearls, and aloe vera jelly. As though there aren't enough variations already, you can also add extra ingredients to bubble teas. Among the other bubble tea additives are sweet "soups" such as red bean soup, mung bean soup (or "green bean soup"), or dried-and-reconstituted longan (dragon’s eyes) soup. These add sweetness, color, texture, and flavor to bubble tea. Another common bubble tea flavoring comes from powdered pudding mix, which can be mixed into the drink or added as a "topping" (not mixed in, but allowed to sink to the bottom). Popular flavors of pudding for bubble tea include chocolate, egg custard, mango, and taro. Some bubble tea drinks also include fresh fruit (especially mango, lychee, or passion fruit), fruit jams or jellies, and other ingredients.